Rift Labs have announced a new high quality diffuser for the KICK light that will transform it from a small, yet powerful LED light, to a professional piece of lighting equipment, ideal for professional photographers. The new KICK diffuser creates a softer light with minimal light loss and comes with a micro lens surface 40-degree diffusion front plate for maximum light transmission. The front place is easily replaceable and a range of alternative front plates are available for different levels of diffusion. The KICK diffuser was created due to market demand, with users requesting a robust diffuser to further enhance their creative experience. In order to emit as much light as possible, the inside of the impact resistant hard shell is coated with a hyper-white material, which reflects 98% of the light and provides the same reflection for all wavelengths. The reflective material used is optically stable and has a reflection pattern to assist with colour mixing. 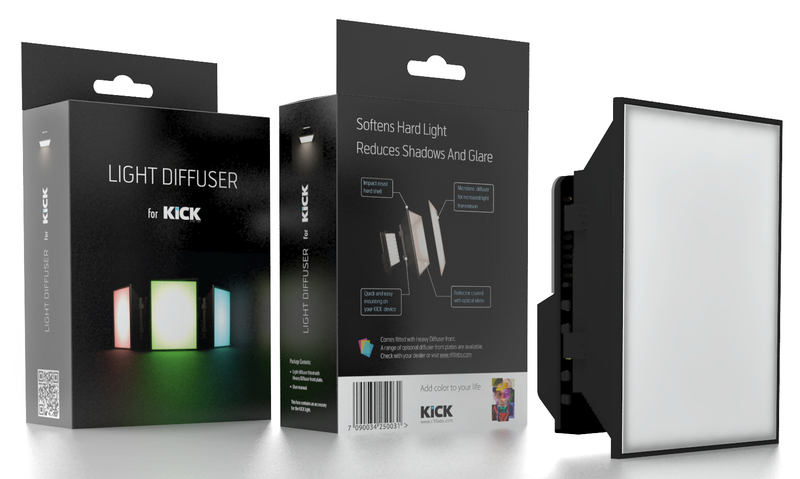 The KICK light, distributed exclusively by Color Confidence in the UK, was launched earlier this year and offers an exceptional range of creative features. It has manual controls and can also be controlled via the free iOS or Android app. The KICK light is about the size of a mobile phone and is one of the most creative camera and video lights of its size on the market. It has a portable rechargeable 400 lumen LED panel and emits the full colour spectrum from such a compact and lightweight unit. In addition to adjustable brightness and colour temperature, it has animated light and built-in video effects. It can be handheld or mounted on a tripod. It is battery powered and works with any camera device, for example smart phones, DSLR cameras and compact cameras. The battery is rechargeable via USB. This entry was posted in Color Confidence, General News, Lighting, Photography, Rift Labs on September 29, 2014 by Color Confidence.